In its third year, Destiny is showing signs of exhaustion, as it retreads old ground and struggles to find inspiration. Rise of Iron is an arrival, a remix, and a remembrance. It puts a sloppy bow on the Destiny we’ve been playing for two years, introducing a final chapter that will stretch until Bungie wipes the board clean and starts fresh with Destiny 2. It’s fun, in a funereal sort of way. Destiny: Rise of Iron is a weird cookie. Bungie clearly put its live team in charge on this one, as there's nowhere near the amount of completely new-feeling stuff packed in as there was in Taken King -- and with so many people getting winded, a step that big was really needed. Yet, if I assess Destiny right now as a total package, with four expansions under its belt and hundreds of [good] tweaks and patches, it's easier to recommend. Rise of Iron is an excellent expansion to Destiny, but it doesn’t have the same lasting impact on the game as The Taken King did. There’s not all that much for Bungie to fix this side of a fully fledged sequel, and so this DLC gets to focus on weaving a new story that delves into the game’s lore, providing hours of new content for the game’s fans to play time and again. The biggest disappointment of the expansion comes in the form of the new social arena, the Archon’s Forge. Billed as a mix between the Prison of Elders and the Court of Oryx, Bungie made some unfortunate design decisions when putting the forge together. They’ve since fixed one of those, making it easier to get SIVA Offerings (which you need to activate the forge), but the instanced event still suffers from a lack of connected players. This is one event that feels like it would have been better used as its own instance in the game (like the Prison of Elders), but instead the Court of Oryx approach leaves a lot of players to tackle their Offerings on their own, which defeats the entire purpose of the encounter. This makes it tougher to take on the more difficult events in the Forge, which has been a huge turn-off for a lot of players so far. Rise of Iron is an average expansion. While the new raid is fresh and fun, this DLC lacks the depth of narrative and lore that was found in The Taken King. Overall, it's enjoyable but there's not much content: Destiny is in desperate need of something new for its second chapter, due on the next year. 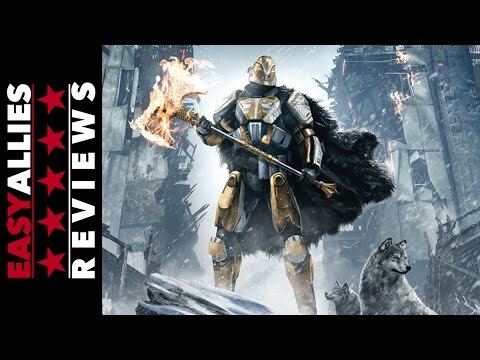 Rise of Iron isn't the most innovative nor biggest expansion pack that Destiny have seen, but still it's a fun one, bringing some fun to those players that want to return to this universe despite the repetitiveness of the formula. Rise of Iron isn't quite the game changer that the Taken King was last year, but it continues to build on the work-in-progress experience that Destiny has become. Looking at it peice by piece it's very easy to discount certain aspects of Destiny, but as a whole there isn't a better or more robust game that ties together single player, cooperative, and competitive multiplayer gameplay the way that Bungie has. Destiny: Rise of Iron is an excellent addition to Bungie’s open-world shooter, but is held back by a weak story, and a leveling meta that requires a bit of grinding. Overall, Destiny looks, sounds, and feels better than it ever has, and there has been no better time to be a Destiny player.